Bail Bonds in Santa Clarita | Jail, Bail and Bondsman Info. You’ll always speak to an owner/agent who will patiently and expertly explain the bail process and personally work with you step-by-step, to have the defendant quickly released from the Santa Clarita Station Jail. We understand the stress and the worry when someone you love has been arrested. 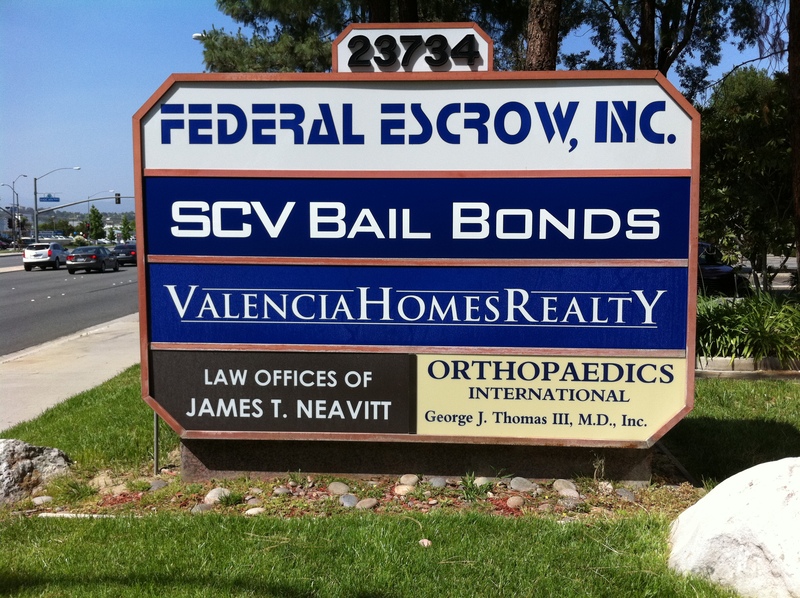 Our SCV Bail Bonds sign stands as a brightly lit beacon of help and assistance to the SCV community and beyond. When someone is arrested in the Santa Clarita Valley area, they will generally be transported to the Santa Clarita Sheriff’s Station jail which is located at 23740 Magic Mountain Parkway in Valencia. We work with the Santa Clarita Valley Sheriff’s Station Jail often and understand the timing in processing the arrestees taken there. The Santa Clarita station has 11 jail cells and can temporarily housing up to 40 inmates. There are other jails located in the Santa Clarita Valley area such as Pitchess Detention Center, and North County Correction Facility (NCCF), however, new arrestees in Santa Clarita may not be transported directly to these facilities. When a defendant is arrested at the Santa Clarita Station Jail, their booking process is generally as follows: They will be fingerprinted and photographs will be taken of them, (also called mugshots). Their information will also be entered into a nationwide database or “Live Scan” to make sure there are not any parole holds, warrants or immigration holds, etc. The booking process can take anywhere from 2 to 4 hours or longer, depending upon the individuals background and circumstances. Once their information comes back clear, they will be ready for bail. If the defendant is not bailed out quickly, they will remain in custody until their upcoming court arrangement. Unfortunatelly, if they are arrested on a Friday, they will have to wait until Monday for their court appearance. It’s important to understand that if the defendant makes the jailer aware of any medical issues, or they require any special medications, they may be transported to the Los Angeles County Twin Towers Facility. Women will be transported to the Lynwood Jail or (CRDF). If this happens, it can take much longer, up to 24 hours to bail them out of the larger Los Angeles County facilities. This is why we always suggest bailing them out while they are still at the local Santa Clarita station jail for a much faster release time. All defendants being held in custody at the Santa Clarita Jail are allowed a phone call to a bail bondsman, clergy or an attorney. Defendants can call us collect from jail, 24 hours a day at 661-299-BAIL (2245). We can personally work with you and your family to handle the easy bail application and contract. You can meet with us in the comfort and privacy of our conveniently located office directly across from the station 24 hours a day. We can also meet with you at your home, office or at the Santa Clarita Station jail. Alternately, you can also receive the bail paperwork by email or fax from anywhere nationwide. The approval for the bond typically takes about 10 minutes and consists of a few questions relating to the defendant, such as their employment status, family, homeownership, credit status and citizenship. We always work carefully to make sure our clients understand all of their their responsibilities before filling out any bail bond paperwork. Once the paperwork and payment are complete, the bond will be posted at the jail. The release time at the Santa Clarita station can take from 30 minutes to 1 hour. We can always answer any questions you have about the bail application process. In California, the cost of a bail bond is set at 10% of the total bail amount. So, if the total amount of bail is $15,000, then the cost of a bail bond will be $1,500. With us, there are never any finance charges, fees or taxes included. To make it easier, we offer flexible payment plans and take most major credit cards, cash, checks, direct deposit and wire transfer. Very often, we can write what’s called a “signature bond,” without the requirement of collateral. Call and speak with a licensed agent to go over all of your payment qualifications and bail bond options. When a defendant has been released on bail, it is very important the defendant and “the indemnitor” abide by all the instructions and court dates set forth. The indemnitor is the person who signs the bail contract, pays the bail bond fee and takes full responsibility to make sure the defendant gets to all court dates. Together, the Indemnitor and the bail agency will jointly promise to the the court that the defendant will not miss any of their necessary court appearances. if the defendant does fail to appear in front of the judge on their court date, a warrant for their arrest may be issued which is also called a “forfeiture.” In our experience, we have found that a missed court appearance is usually a simple mistake which can be easily handled when our bail company is contacted right away. Most Felony cases out of Santa Clarita will be heard in the San Fernando Court. Misdemeanor cases are heard out of the Santa Clarita, Newhall Court. Jail visitation times are from 10:00 a.m. to 2:00 p.m. every day. Santa Clarita Station jail allows inmates 15 minute visits limited to (1) adult and (2) children. Visitors must show valid government issued photo ID, passport or other acceptable form of ID. All visits taken on a first come, first serve basis and subject to delay due to jail staff workload/hours. Visitors at the Santa Clarita Sheriff’s Station Jail will be subject to a search of their person. Visitors subject to arrest should any warrants, illegal drugs or weapons be found by jail deputy. These days, it’s hard to know who to you trust in the bail bond business. We’re caring, professional, licensed California bail bondsmen with experience and knowledge of California’s jail system. We are also a locally owned, locally operated husband and wife team and proud Santa Clarita Community members! We’re members of the California Bail Agents Association and Accredited members of the Better Business Bureau. Read our testimonials and see why we have satisfied clients from the Santa Clarita Valley to the entire state of California and beyond! Watch our latest Santa Clarita Bail Bonds YouTube Video. Be an SCV Bail Bonds fan on our Facebook Page! Call SCV Bail Bonds locally at (661) 299-BAIL (2245) or toll-free, nationwide at 877-422-4591 for professional, experienced bail service that you can trust. And see why choosing the right Santa Clarita Valley Bail Bond agency can make all the difference to you and your family!